Michael and I had the house unexpectedly to ourselves tonight when my parents decided to drive up to see my brother compete in a CrossFit tournament tomorrow. A night to ourselves…is kind of a big deal for us considering that we are living with my parents at the moment. I didn’t want to waste it. At the very least, we had to have a Movie Night. The problem is…we are both exhausted. 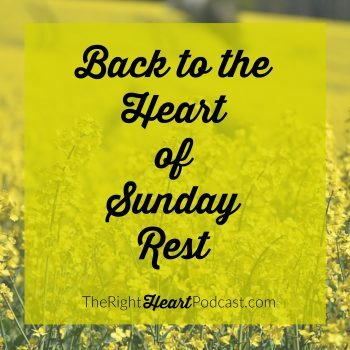 Michael from working overtime (plus suffering from a head cold) and me from…Motherhood. You know how it goes. Well, being the Well-intentioned Wife I am, I brought out the big guns and drank a Coke as soon as the kids went to bed so that I would be able to stay awake for an entire movie. (I also forced myself to eat a large piece of Valentine’s Day cookie cake to capitalize on the sugar helping me stay awake.) Well, it turns out my poor hubby, for one of the first times in my memory, wasn’t up for staying awake for an entire movie…just my luck. Ick…all of those good intentions and caffeine and sugar going to waste (=my hips) and keeping me up way past my bedtime. Not to mention, being the Well-Intentioned Wife that I am, I promised Michael he would get to sleep in tomorrow. Ouch. I guess I’ll have to eat another piece of cookie cake in the morning to help me wake up. So now I’m up late by myself watching Grease on ABC Family and posting pictures of the cutest kids in the world on the Internet. You know, that John Travolta really was a cutie pie too. But my kids will not be watching Grease until they can write essays pointing out the social and moral problems depicted and promoted by the film. Call me what you will on that one. Now for some pictorial excerpts of Franco Family Fun that might briefly entertain you if you’re up late like me because you drank a Coke trying to be a Good Wife, or maybe if you’re up nursing the baby because you’re a Good Mommy. Or if you’re related to me and you’re excited to see pictures of the kids. Wherever and whenever you’re reading this, God bless you and keep you, sweet reader. Enjoy! Michael’s arrival home from work is a Big Deal, every day. It is fun to wait outside on the driveway with the kids and get them all riled up when we see that white sedan peek around the corner down the street. 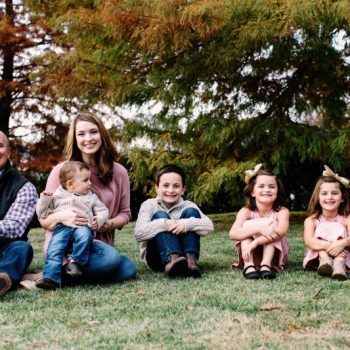 What a blessing to have such happy children. We have our first Domestic Church circle meeting in a couple of weeks. We are pretty excited. 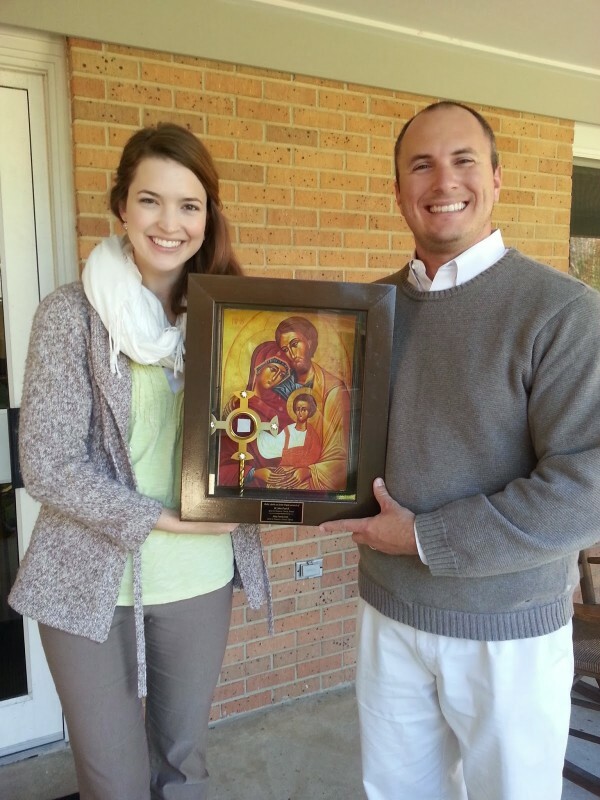 This is a picture of Michael and I at our retreat holding a relic of John Paul II, a piece of his cassock from the part that covered his heart (the little white square in the lower left-hand corner of the picture). The beautiful icon of the Holy Family is (I think) the official icon of Domestic Church. I would love, love, love a big print of this icon for my Future New Home. 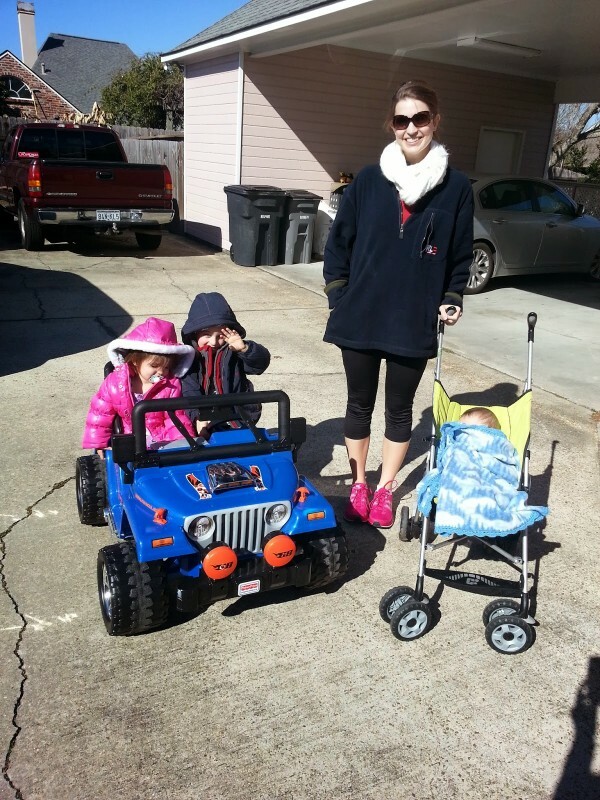 We often go out for walks with the kids’ little Jeep. They absolutely love it. Gabe is a great little driver, and Faith is happy as a clam to be a passenger. Gianna never makes a peep in the stroller. Fuss- and whine-free time is Heavenly time. I really enjoy getting out of the house, plus get a little exercise jogging behind the Jeep pushing the stroller. The Jeep’s slow mode is really too slow for a walk, but the fast most is a tad too fast for me to just walk behind it, so I have to do this little-ole-woman jog gait, but I don’t mind. 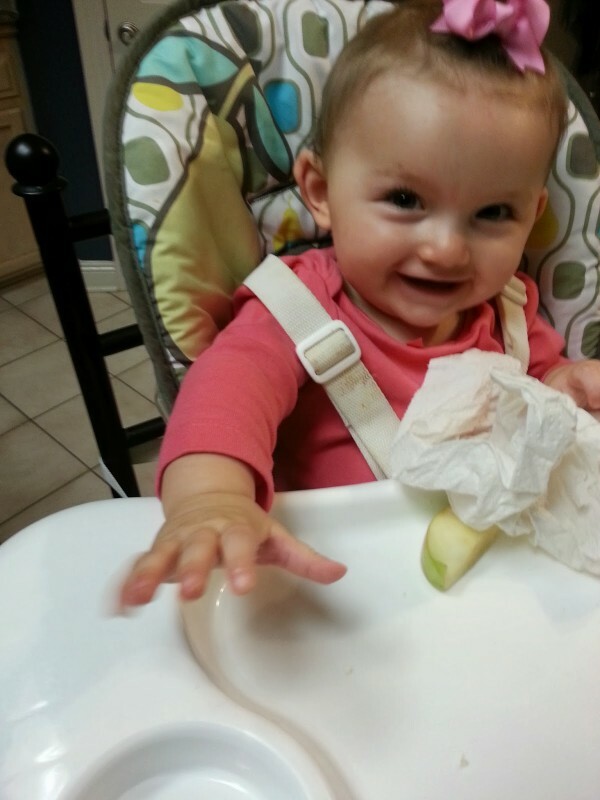 I love taking high chair cell phone pics of Gianna. 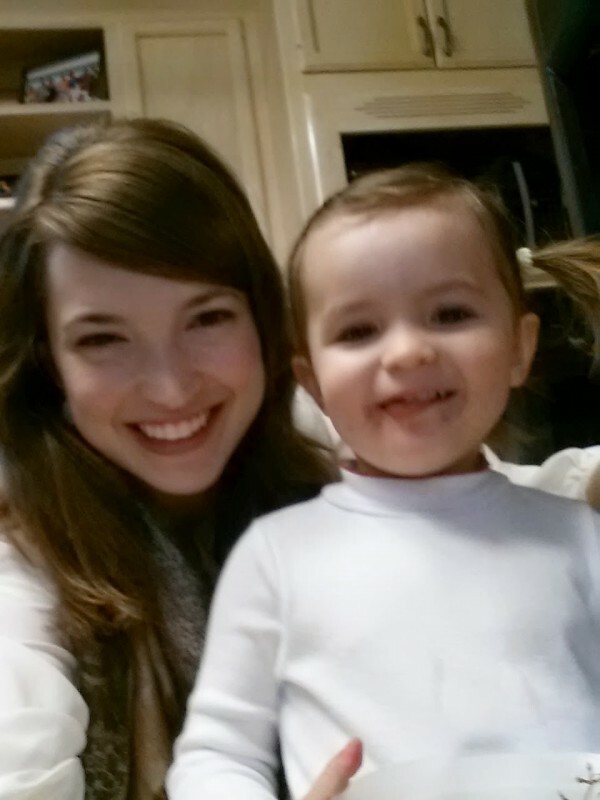 She’s such a precious baby and is quite an enthusiastic eater. 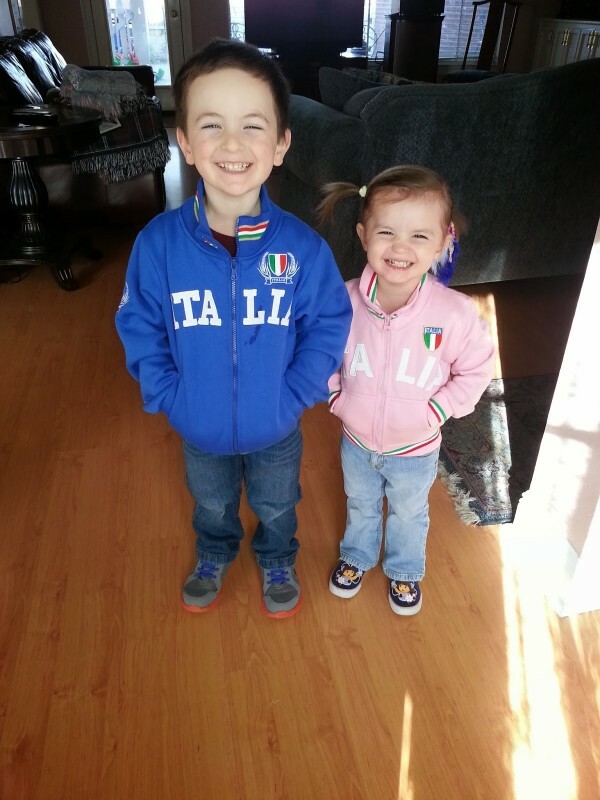 Thank you, Uncle Ry-Ry, for the super-cute, sporty little jackets you brought back from Italy! 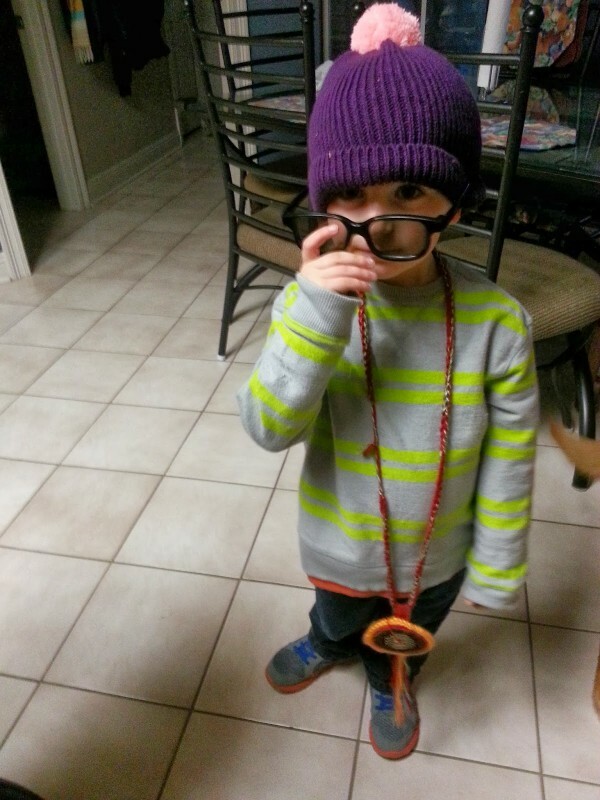 A-dorable. We went out a few weeks ago to meet some friends for dessert, but (to make a LONG story short), we never made it to their house, and we ended up at McDonald’s instead, where we bought little sundaes for the kids. 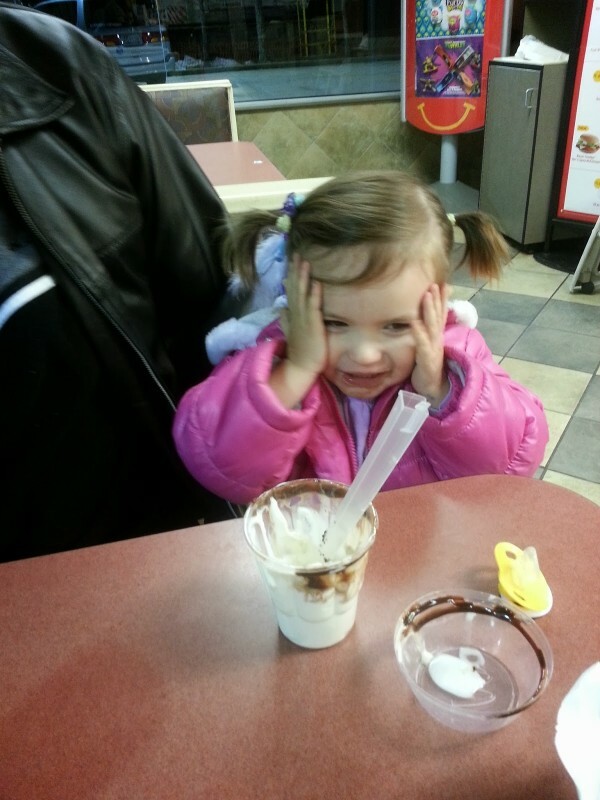 Can you say, ‘Baby’s First Brain Freeze’? 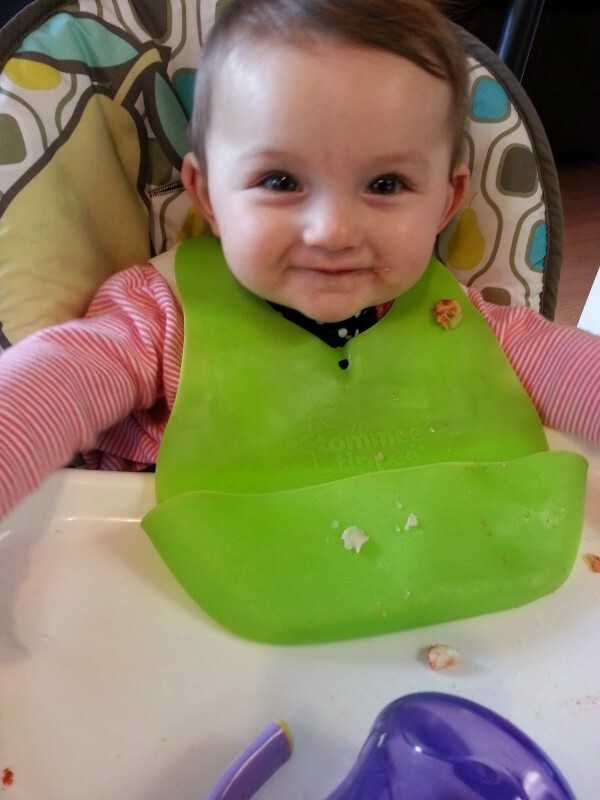 Did I mention I love to take high chair photos? 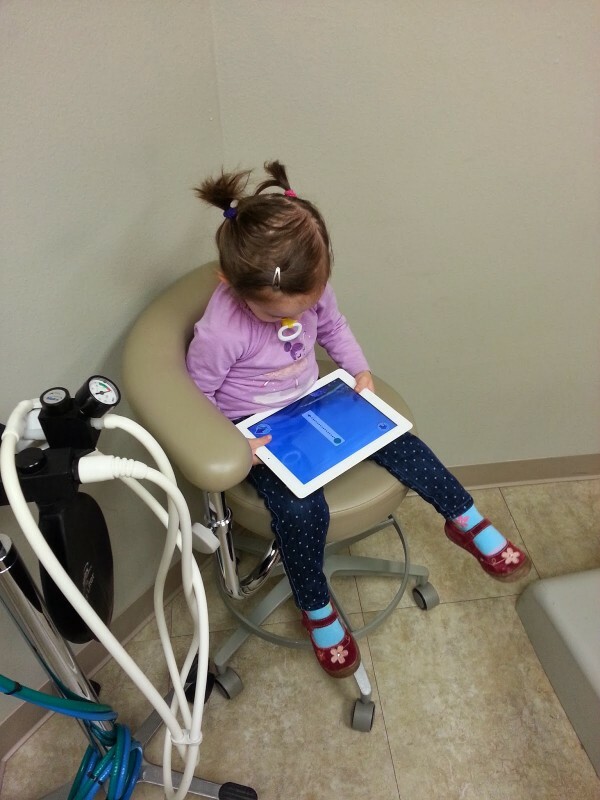 This looks like I was a smart, hip mom to take the iPad with me to the dentist to entertain the kids…but my kids don’t really know how to work the iPad yet. Parenting fail. Maybe you can help me decide which thing is the fail though. 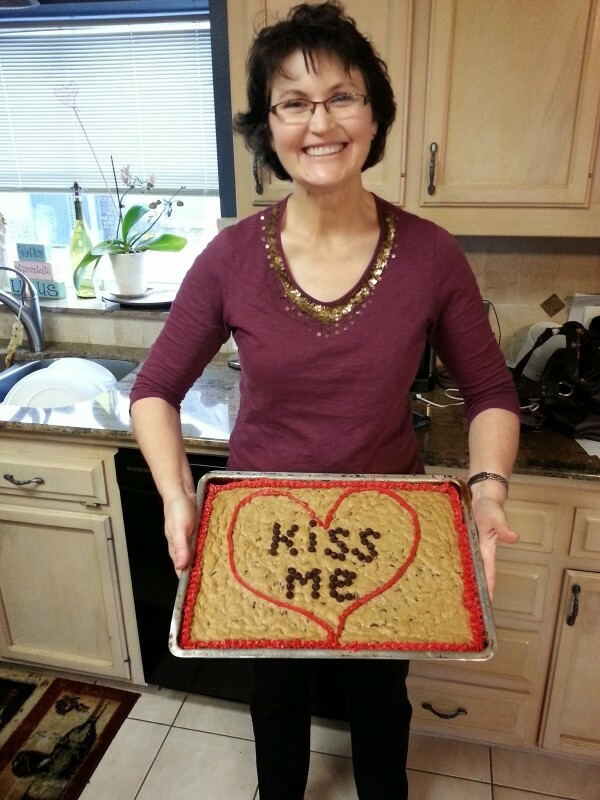 We made a delicious cookie cake for our boys for Valentine’s Day dessert. (Hint: Just use the recipe on the back of the Tollhouse chocolate chip bag and smush it in a pan.) Mom is going to be horrified that I posted a picture of her on the Internet, even though she’s beautiful and looks adorable in this picture. Michael took me out to dinner with a small event that included a marriage talk given by a great priest from our area. 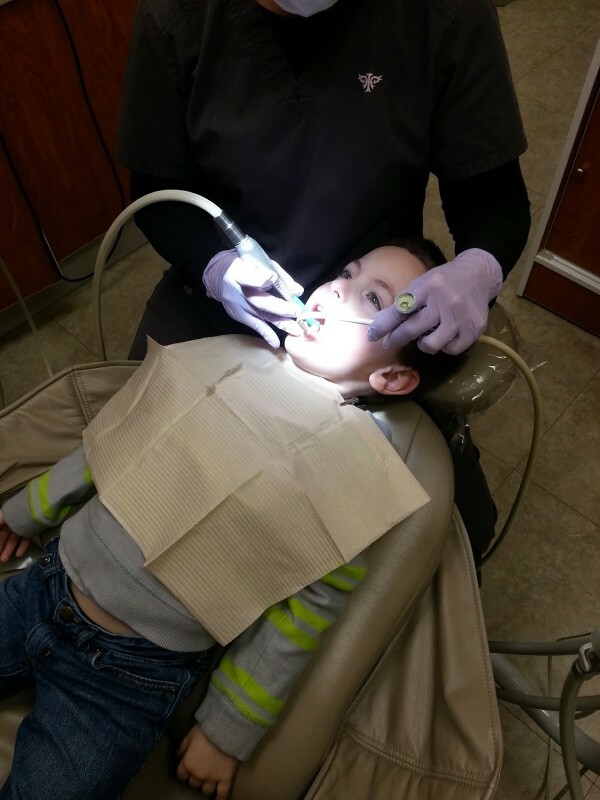 We enjoyed visiting with some wonderful friends and meeting some new ones. We also enjoyed the marriage talk, especially the hilarious video at the end. Glad to see you are settling in to your new life! I have missed getting your updates in my inbox!